My addiction began in high school with what I then perceived as innocent use of alcohol on the weekends after games. This was a gateway to marijuana, cocaine and painkillers, until I completely spun out of control. When I was growing up, the “D.A.R.E.” program was everywhere, and although the intentions were only to help prevent addiction it had a conflicting and confusing impact on my decisions. Reflecting back on law enforcement’s “do drugs once and they will kill you” approach after I experimented with drugs and realizing that they didn’t kill me. In fact, it was initially the opposite, they made me feel good. This realization brought about doubts to anything that I had heard during these programs since they must not have known what they were talking about. However, there was one important thing I was missing. That short time that drugs made me “feel good” was actually the hook, but by the time I realized this, it was too late. I am now endorsed by law enforcement and am working together to more effectively inform young people regarding drug and alcohol prevention. During my football career at the University of Idaho, in an attempt to get a prescription written for vicodin, I even went to the extremes of breaking my own foot by kicking an oak coffee table repeatedly. I hated reality and I hated myself. This is what drugs did to my mind and this is the “hook” that I talk about. I lived this hell and I speak to others in the hopes that they can avoid what I experienced. As my addiction progressed so did my involvement in criminal activities. Unfortunately, I have spent much of my life rubbing shoulders with people involved in organized crime, gangs, drug smuggling and the list goes on. I know first-hand the consequences of breaking the law and the truth behind what is portrayed in movies, music and other media that glamorizes “gangsters,” the mafia, drug smugglers, etc. I give a behind the scenes look at this dark world of crime and it’s characters, in the hopes that the younger generation will think twice before trying to emulate them. When I was in high school, I thought that I had so many close friends. I was popular and had a large circle. I was blindfolded to the truth about what a real friend really was. Some of these “friends” sat quietly and watched as I walked off a cliff. Some even encouraged me to keep walking. In fact, I often times use this ‘cliff’ scenario as a teaching tool during my presentations. I invite young people to evaluate the friends that they have in their own lives, and ask themselves, “are these people who want me to succeed? Are they helping me be the best person that I can be? Peer pressure is usually the driving force behind drug and alcohol experimentation. This leads to drug and alcohol use, it’s abuse and then towards dependency and addiction. It has become commonplace to hear about drug overdoses, drunk driving deaths, teen pregnancies, etc. that it no longer has the shock factor that it used to. Sitting in the chairs or bleachers as a middle school, high school or even college student, many never think that this could happen to them. I know this because I was once sitting there. My message is exactly the message that I needed to hear, but never did. Prison is one of the worst places on earth. Depending on the audience, depends on the depth that I go into my experience and knowledge of this “culture.” The consequences of poor decision making has an impact on the life of an addict well before this usually becomes a reality. However, prison is very much a part of my story. The graphic detail of what I went through during a 7 month time period in the “hole” is guaranteed to open anyone’s eyes and question whether or not they should continue down the road that they are on. Everyday, we are given choices. In all of us, there is that inner voice that tells us right from wrong. The outcome of someone’s life, depends completely on the choices that they make. I was forced to look at the truths of my life and who I had become. I had no one to blame but myself for the choices that I made. I was selfish, dishonest and completely naive to what true success really was. I realized that “what comes around goes around”. The world that these young people are preparing to enter is often materialistic and the image of success is so often only viewed from a financial stand point – not on the character or moral values of an individual as it should be. When you do the right thing, you feel good, and when you feel good, you are happy. I believe that being happy, is all of our goal, and doing the right thing helps us get there. I was crushed. I vowed to never play again. It took three years before I finally started to listen to that inner voice again, who knew that I could be a great receiver. Four years after that, I held every receiving record there was at Monroe High School. That summer I was packing my bags and driving off to Moscow, Idaho – the home of the “Vandals” – to play football at the University of Idaho. Just like my dad. My point for telling this story is simple:I never let anyone or anything get in the way of my dreams. Then I took drugs. A record breaking two sport athlete in high school, Curcio went on to play football at the University of Idaho. During his sophomore season, he injured his knee and was prescribed Vicodin, which eventually led to a full blown addiction. As this addiction progressed so did his involvement in criminal activities, including the robbery of a Brinks armored car in 2008. Curcio’s robbery gained national attention as details were released regarding the elaborate heist of $400,000 outside of the Bank of America branch in the Seattle area. For months, Curcio studied the armored car movements and his getaway. He posted a Craigslist ad soliciting day laborers for a construction job. On the day of the planned heist, he instructed them to wear a very specific outfit and to arrive at the bank parking lot at the time he was to rob the Brinks truck. On Sept. 30, 2008, dressed exactly like the men he “hired” from craigslist, Curcio approached the Brinks truck, sprayed the driver with mace, and took the bags of money. He then ran to a nearby creek where he had previously setup a cable pulley system to carry him and the money upstream in an inner tube to a waiting getaway vehicle. However, Curcio did not get far thanks to a tip from a very attentive homeless man who had witnessed a “dry run” weeks before the crime. This tip eventually led to Curcio’s arrest after federal agents were able to link him to the crime using DNA evidence. He was convicted and sentenced to six years in prison. 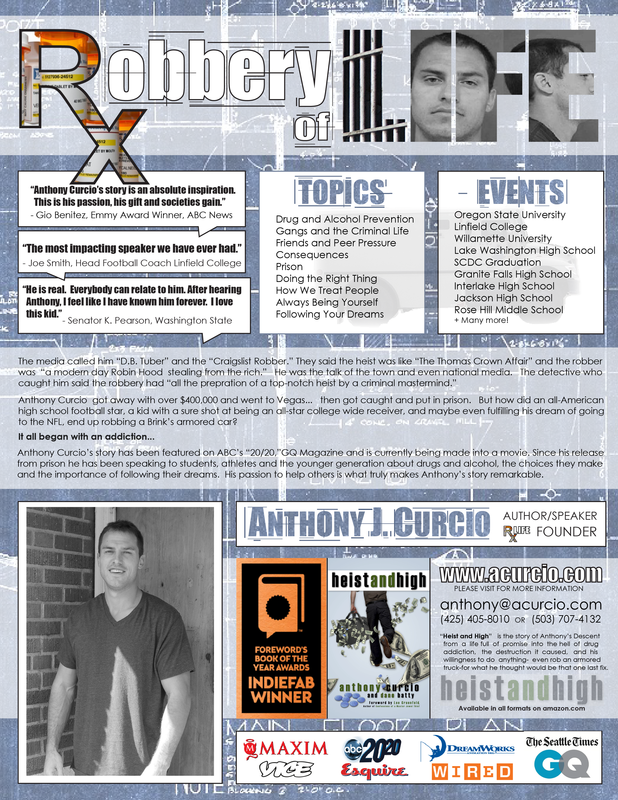 While in prison, Anthony co-authored a book titled “Heist and High,” which tells the story of his once promising life and the downward spiral that followed his addiction – including spending nearly 7 months in solitary confinement during his prison sentence – where he found himself and what he believes, his purpose. Since his release from prison, Curcio has been speaking to youth at middle schools, high schools, colleges and even jails, warning as many as possible about the dangers of drugs and alcohol.